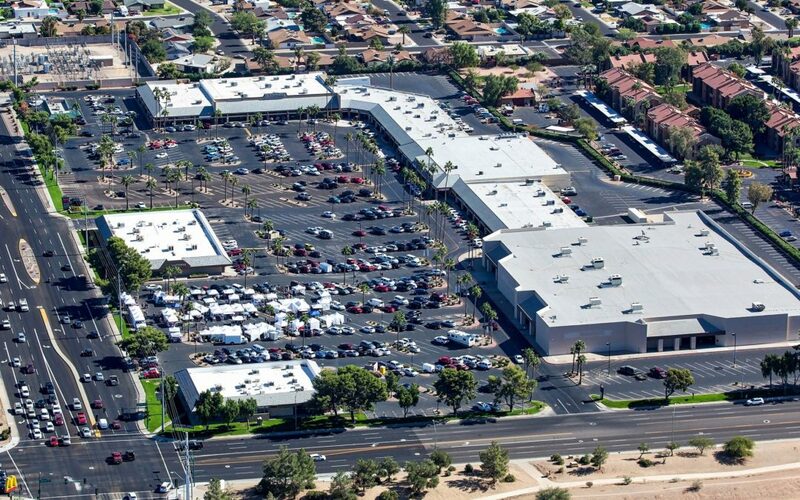 Deer Valley Center, a 128,569 SF retail center located at 4123-4273 W. Thunderbird Rd., in Phoenix. PHOENIX, ARIZONA (January 15, 2019) – The $14 million investment acquisition of Deer Valley Center in Phoenix and three land sales around the Valley totaling approximately $4.7 million highlight recent deals closed by NAI Horizon professionals..
Lane Neville, Barbara Lloyd and Logan Crum negotiated the sale of a retail property, representing the buyer, 29 Bell, LLC, for $14 million. The property is located at 4123-4273 W. Thunderbird Rd., Phoenix, AZ. NAI Capital represented the seller, Deer Valley Center, LLC. Lane Neville and Barbara Lloyd negotiated the sale of a 2.52-acre land parcel, representing the seller, Gilbert Growth Properties, LLC, for $1.937 million. The property is located at the SWC of Pecos & Market Street, Gilbert, AZ. Velocity Retail Group represented the buyer, Barkan Brothers and Friends, LLC. Chris Gerow, Shelby Tworek, Gabe Ortega, Patrick Anthon and Horth Hong negotiated the sale of a 4.16-acre land parcel, representing the seller, United Group, LLC, for $1.7 million. The property is located at 706 & 724 E. Southern Ave., Phoenix, AZ. Chris Gerow, Shelby Tworek, Gabe Ortega and Patrick Anthon negotiated the sale of a 54,993 SF land parcel, representing the seller, The Market at Estrella Falls, LLC, for $1.05 million. The property is located at 1600 N. Pebble Creek Parkway, Goodyear, AZ. Max Bippus with CBRE represented the buyer, Navy Federal Credit Union. Laurel Lewis, Barbara Lloyd and Lane Neville negotiated the sale of a 4,051 SF office property, representing the seller Troon, LLC, for $268,141.50. The property is located at 10031 E. Dynamite Blvd., Building E, Scottsdale, AZ. Danny Mikhail with D.E.N. Development Group represented the buyer, M Brothers Troon, LLC. Laurel Lewis, Barbara Lloyd and Lane Neville negotiated the sale of a 1,931 SF office property, representing the seller, Troon, LLC, for $140,963. The property is located at 10031 E. Dynamite Blvd., Building E, Scottsdale, AZ. Dan Nickles with HomeSmart represented the buyer, Argyle First Realty, LLC. Chris Gerow, Shelby Tworek, Gabe Ortega and Patrick Anthon represented the landlord, CC Fund I Northern, LLC, in an 84-month retail lease for 3,000 SF at 9494 W. Northern Ave., Peoria, AZ. Greg Saltz with GPS Advisors represented the tenant, ATI Holdings of Arizona, LLC. Kevin Higgins represented the tenant, AllStaff Services, in a 63-month office lease for 4,499 SF at 340 E. Palm Lane, Phoenix, 85004. Lindsey Carlson with Colliers International represented the landlord, Brookstone Office Complex, LLC. Laurel Lewis represented the tenant, MTI America, Inc., in a 50-month office lease for 2,771 SF at 1711 W. Greentree Dr., Tempe, AZ. Chris Gerow, Shelby Tworek, Gabe Ortega and Patrick Anthon represented the landlord, Queen Creek Fiesta, LLC, in a 60-month retail lease for 1,700 SF at 21545 S. Ellsworth Loop Rd., Queen Creek, AZ. The property was leased to Schmear bagels. Matt Harper represented the landlord, E Espino Investments, LLC, in a 60-month retail lease for 5,688 SF at 2647 W. Glendale Ave., Phoenix, AZ. Mark Wilcke represented the landlord, Native Arizonan Acquisitions IX, LLC, in a 36-month retail lease for 966 SF at 331 E. Chandler Blvd., Chandler, AZ. Tyler Smith, Joe Pequeno and Troy Giammarco represented the tenant, OMNI Bioceutical Innovations, Inc., in a 39-month industrial lease for 3,227 SF at 7855 E. Evans Rd., Scottsdale, AZ. Mike Kane with Colliers International represented the landlord, Rainbow J Corporation.